Death is often called the great leveller; it’s also the great euphemised. I have a book on euphemisms with a full chapter devoted to it, and I’m sure that’s not unusual in the niche. The idea of death also recurs in slang and metaphor, as Jonathon Green shows here, at least some of the time for similar reasons of delicacy and evasiveness. Much of slang by its very nature goes unrecorded, or at least did so before the internet turned half the world into quasi-publishers. This makes tracking the history of slang a real challenge – how do you flesh out something that never had a proper skeleton to begin with? Enter Jonathon Green, aka Mister Slang, whose new book Language! 500 Years of the Vulgar Tongue provides a sturdy history. (Its publisher, Atlantic Books, kindly sent me a copy for review.) Language! is a thoroughly engaging account of slang’s development from the early days of criminal cant to the broader current-day incarnations stemming from our cities’ subcultural and multicultural vernaculars. Born in the street, it resists the niceties of the respectable. It is impertinent, mocking, unconvinced by rules, regulations and ideologies. It is a subset of language that since its earliest appearance has been linked to the lower depths, the criminal, the marginal, the unwanted or even persecuted members of society. It has been censored, ignored, shoved to one side and into the gutter from where it is widely believed to take its inspiration and in which it and its users have a home. It remains something apart, and for many that is where it should stay. 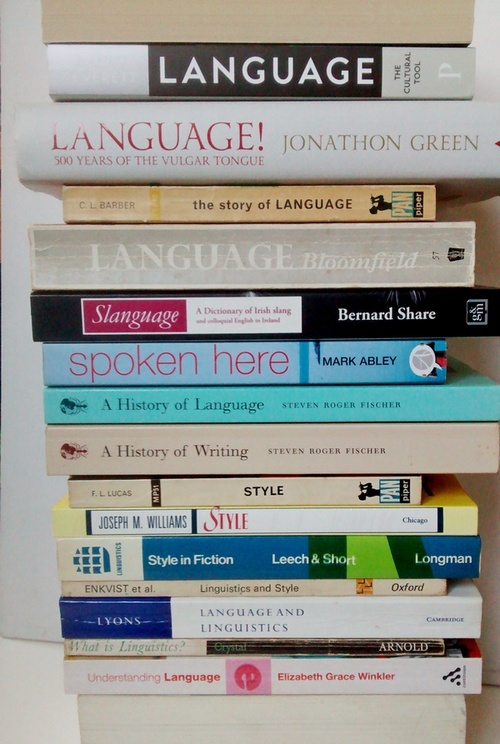 Chambers Slang Dictionary by Jonathon Green is my usual first stop for slang queries and browsing, because it’s the biggest such book on my shelf – size matters in lexicography – and also the best. A quote on the spine says, “Dr. Johnson would have moaned with delight”, and while I could live without the thought of Samuel Johnson making pleasure-noises on my shelf, the sentiment holds. This blog normally focuses on text, sometimes on images and video. Audio is relatively under-represented, so what follows is a selection of podcasts and interviews I’ve listened to lately, in a language-and-linguistics vein. Some of you already know about Lexicon Valley, a new podcast on language from Slate, hosted by Bob Garfield and Mike Vuolo. There have been six episodes so far, 20–40 minutes long and covering such subjects as syntax, taboo words, pseudo-rules and Scrabble. The show is entertaining, well-researched, and sometimes surprising. Critical reaction from linguists and others has been very positive. Arnold Zwicky, who features in one show, is impressed, while Neal Whitman finds it interesting and linguistically sound. Dave Wilton thought the first episode fun and first rate, despite one minor criticism; Joe McVeigh (“excellent”) and Crikey (“treasure”) also praised it. Lexicon Valley is on a temporary break but will soon be back with new episodes. Listeners are invited to comment and suggest ideas for future coverage. Since 2009, to mark National Grammar Day in the U.S., John McIntyre of the Baltimore Sun has been writing humorous pulp serials which he calls Grammarnoir. This year they reappeared as podcasts: Grammarnoir 1 (2009) (text); Grammarnoir 2 – Pulp Diction (2010) (text); and Grammarnoir 3 – The Wages of Syntax (2011). Grammarnoir 4 (2012) has yet to be broadcast, but the script is online in four parts: one, two, three, four. Each serial plays with the style and language of hard-boiled crime fiction, and is packed with drama, derring-do and editorial wit. Slang lexicographer Jonathon Green, author of the three-volume Green’s Dictionary of Slang, gave a lively and fascinating interview with New Books Network about slang in all its rambunctious glory. A voluble and thoughtful speaker, he discusses lexicographical research, historical attitudes to slang and taboo, the Urban Dictionary, and more. If you compare two things, one’s gonna be up and one’s gonna be down, and then you use than, but if something is simply different, it’s different from the way it used to be. (It’s possible she said gotta rather than gonna; I couldn’t tell.) Garner defended the usage, saying that different from would have been “very awkward and difficult” in the instances in question. My post on different than, from, and to, which received a fresh flurry of comments recently, shows that different than is acceptable. Finally, a shout-out to A Way with Words, a public radio favourite hosted by Martha Barnette and Grant Barrett, which I’ve been enjoying for years and recommend highly to anyone unaware of it. Etymology, wordplay and dialectal variation are recurring themes. If you know any podcasts or other audio material that you think I might enjoy, language-related or otherwise, feel free to suggest them.